Xing Guardian slot is added to the now extensive collection of Nextgen's Chinese-themed slots such as Tianlong, Eastern Dragon and Emperor's Garden. Unlike those three however, Xing Guardian is a 1024-way game on a 4x5 grid and has no pay lines. The reels are transparent and lie over a dusk background of an Eastern fantasy valley with pagodas built on the sides and of course we have an Oriental musical accompaniment consisting of pipes and cymbals as is typical of these themes. Xing itself can mean 'happy' in China or in this case it more likely refers to a Guardian of the ancient Xing Dynasty - so how will he guard your wealth? The symbols are reflective of the theme and in this case card icons are represented pictorially and appear one or two rows high. The premium symbols are single and are the Dragon and Rooster paying 1.5x bet for 5-of-a-kind with the Leopard and Serpent paying 1x and lastly the Lotus flower and Gold Ring a mere 0.5x bet. The card icons pay a paltry 0.2x stake for 5 and this gives us an idea of the low volatility of Xing Guardian. Surely things must improve from here? Indeed they do as all reels have a fully-stacked Wild featuring the Xing Princess which will pay you 2x bet for a 5-of-a-kind and therein lies the potential of the base game and free games - 1024 ways x 2 means a potential maximum win of 2048x bet! There are also a couple of in-play features: firstly the Xing Guardian Locked Reels means on any spin 2 to 5 reels may clone and spin together, in the same way Netent's Twin Spin slot does on every spin. This where you need to see the stacked Wilds, and similarly the second random feature, Rise of The Dragon, results in a Dragon appearing and turning one or more reels into stacked Wilds too. 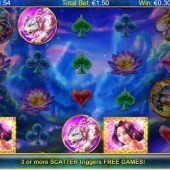 The last symbol to describe is the Golden Ying Yang scatter which appears on all 5 reels and triggers 10 free games when 3 or more appear. 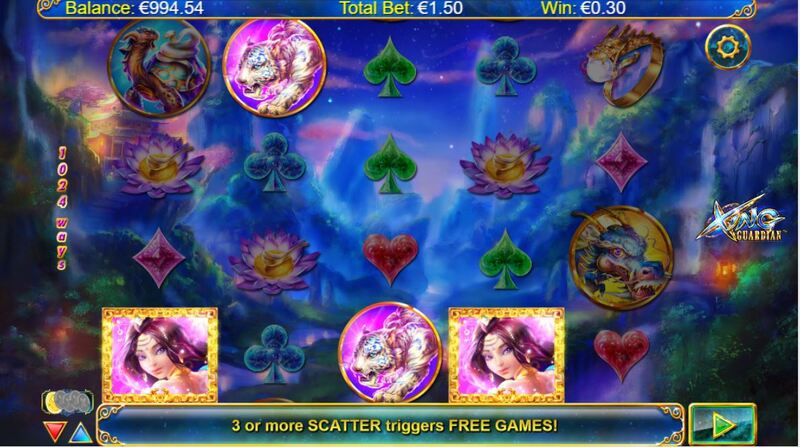 You don't get a full retrigger but 3 or more will award 5 extra spins, similar to the scatters in Medusa 2 free games. And Medusa 2 brings us on the the enhancement in the free games - as on that slot, every free game will have 2 to 5 reels locked together with the Golden Dragon's flames surrounding them as they spin. Xing Guardian slot is pretty much hybrid of 2 separate older games, but somehow it seems to work. There is a generous 97.02% RTP and small reel wins occur on nearly every spin in the base game, although some players may find the fact that virtually every decent win will have to be a result of a feature quite annoying. If that's the case, just hope those stacked Wilds arrive for you. The graphics are smooth and detailed and music not intrusive and due to the aforementioned low volatility your balance will have some longevity. Will you let the Guardian look after your balance?